Attack 1 : Kill Justin Bieber!!!!! Keep flipping a coin until 10 are heads. Does 20 times the number of tails damage. Attack 2 : I HATE JUSTIN BIEBER!! Vote 1 star if you love Justin Bieber. Vote 2 stars if you don't mind. Vote 3 stars if you know 1+1. 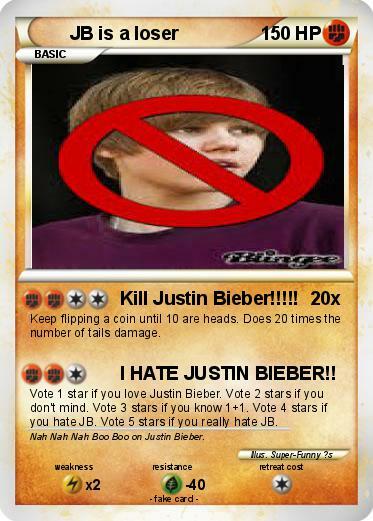 Vote 4 stars if you hate JB. Vote 5 stars if you really hate JB. Comments : Nah Nah Nah Boo Boo on Justin Bieber.